Aspiring opera singers from the Gulf Coast will once again vie for the national spotlight during the annual Metropolitan Opera National Council District and Regional Auditions Saturday, Jan. 11 and Sunday, Jan. 12 at Loyola University New Orleans. The winner of the regional auditions will advance to the national semi-final round, held Sunday, March 23 on the Metropolitan Opera Stage in New York City. The singers who advance to the finals Sunday, March 30 will be accompanied by the Metropolitan Opera Orchestra. The district auditions Jan. 11 at 10 a.m. are free and open to the public. General admission to the regional auditions Jan. 12 at 1:30 p.m. is $10, but free for students and members of Amici, the volunteer support group for the Metropolitan Opera National Council Auditions. Anyone who signs up for membership to Amici at the event Sunday will receive free admission and an invitation to the post-audition reception. All auditions are in Louis J. Roussel Performance Hall, located in the Communications/Music Complex on Loyola’s main campus. Judges for the district auditions on Saturday are world-renowned tenor Paul Groves, veteran soprano and teacher Gianna Rolandi, and opera director Bruce Donnell. Gayletha Nichols, director of the Metropolitan Opera National Council Auditions, will join them on Sunday for the regional auditions. 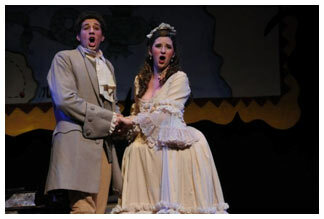 The auditions discover promising young opera singers and help develop their careers. Occurring in 13 regions across the United States and Canada, each of the 40 districts within these regions provide an opportunity for talented singers to compete at a local level. Many of the world’s foremost singers, including Renée Fleming, Susan Graham, Thomas Hampson, Ben Heppner, Jessye Norman, Samuel Ramey, Frederica von Stade, Deborah Voigt and Dolora Zajick have received awards from the National Council. Annually, approximately 100 former contestants appear in Metropolitan Opera productions.